Working from your desk can take up a large portion of the hours in your work day. It's important to find a chair for your desk that fits your style, that's comfortable, that's durable and is affordable. Our desk chairs come in a variety of styles from contemporary to traditional to executive and in a variety of fabrics from mesh, leather and other durable fabrics. An everyday task chair built to accommodate almost any user, the Emme 4107-S2-A56 chair features a 300lbs weight capacity and a simple swivel tilt adjustment mechanism. 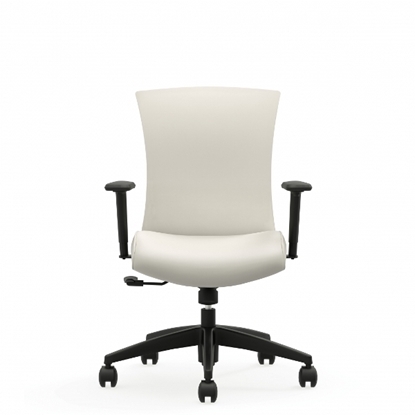 This chair is an idea choice for conference rooms or any individual or joint workstation. A modern styled swivel tilt office chair, The HB 7107K-S2-A40 from Highmark adjusts to fit into any office environment. It features a unique Knit back, which is available in 6 colors, allowing you to design a chair to match any office, conference room, or executive office decor. 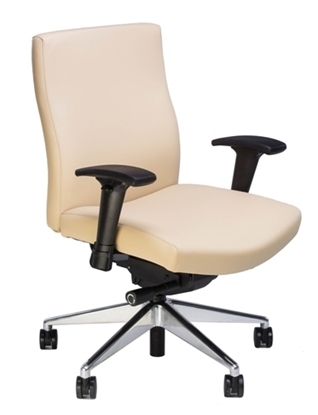 A great choice for almost any home or office setting, this upholstered task chair features pneumatic seat height adjustment, tilt tension control, and is available in a wide variety of color choices. A high back multi-tilter office chair, the Truform 5450-3 is designed with gently curved, streamlined seat and back cushions with multiple adjustment features. It is an ideal seating solution for your executive desk or home office workspace. Available in Ebony or Slate fabric colors. Get free shipping when you order today! 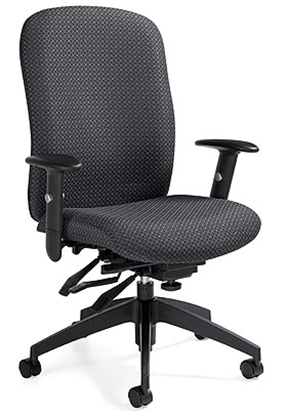 The Granada mid back office chair with arm rests provides comfort and support, allowing you to concentrate on work. Fully adjustable to personalize your height and tension. Pick from four different fabric choices to match your business or home office decor. Global chairs are GreenGuard® certified eco friendly. All chairs include free shipping and warranty. An everyday task chair built to accommodate almost any user enhanced with body balance technology which adjusts to your every move. The Emme 4107-S2-A56 chair features a 300lbs weight capacity and is an ideal choice for almost any setting. Order now and get free shipping! 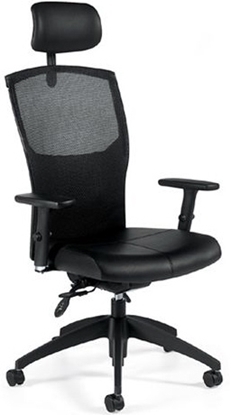 A modern styled office chair featuring body balance technology which adjusts to your every move. The HB 7107K-R2-A40 from Highmark is available in 6 knit back colors and is versatile enough to fit into any office environment. Order today and get free shipping! The Granada Deluxe mid back office chair is designed with you in mind. The 1171-3 is extremely supportive and features many adjustments, conveniently accessible to adjust the chair for your optimum comfort. A great choice for an executive desk or home office workstation. Intuitive, modern, affordable, and green. The InTouch 207-R1-A1 office chair marries the award-winning InSync platform with edgy design, exemplifies our ongoing commitment to body balance technology. Offered in six designer colors on the innovative Thermoplastic mid-back. The Phoenix Series offers form and function with modern lines. 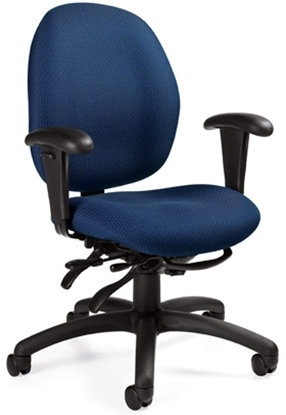 Easy to use ergonomic adjustments makes Phoenix a smart choice in any work environment. 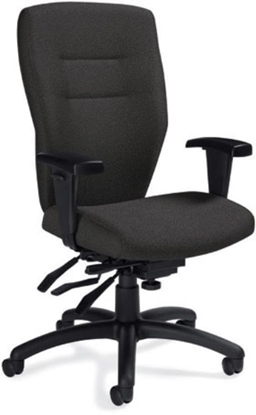 A high back version of one of our most comfortable chairs, this Global high back office chair offers superior performance at an affordable price. 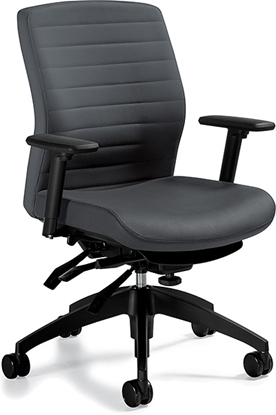 The Granada features a deeply curved back rest, providing excellent lumbar support. The contoured seat promotes proper blood circulation. GreenGuard® certified eco friendly and full warranty. Perfect for a business or home office. Order today and get free shipping! 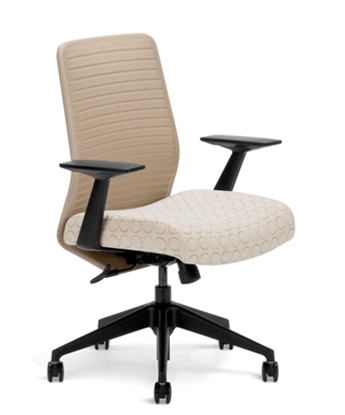 This Intouch modern office chair exemplifies our ongoing commitment to Body Balance technology. Includes width and height adjustable arms. 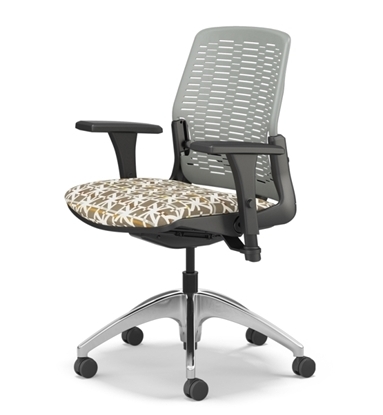 Offered in 6 designer colors in innovative Thermoplastic mid-height back, Intouch provides superior comfort and support. 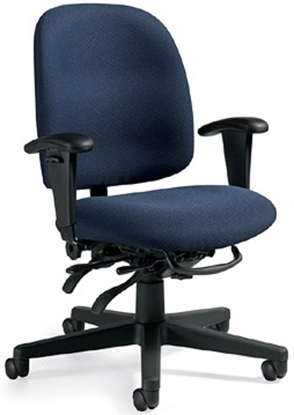 A comfortable low back office chair, the Malaga offers good support that cuts down on fatigue. The seat is sculpted and padded for a good feel. The Malaga works well around a conference room table or with a home office desk. Free shipping and warranty on all discount office furniture by Global. 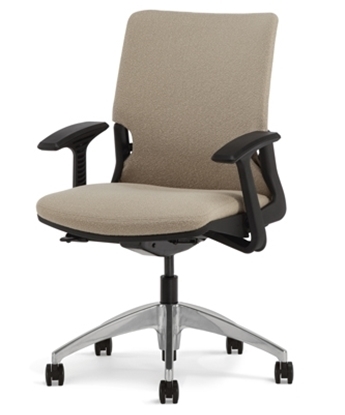 A mid back executive chair, the Global Aspen features ergonomic adjustments and form fitting back support. 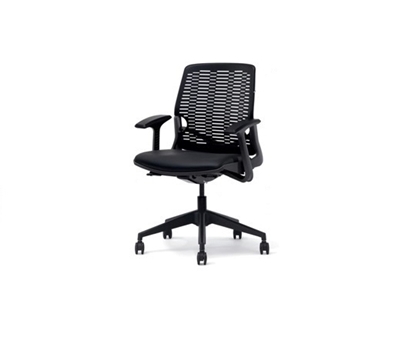 This chair is a great choice for conference rooms, an executive desk, or home office workstation. Get free shipping on all discount chairs! A stylish high back leather executive office chair, the Alero is very comfortable and presents a good image. 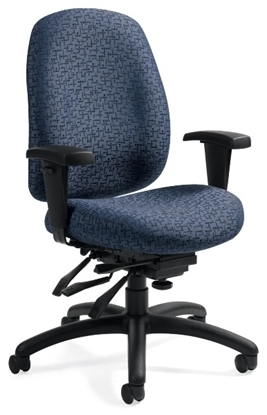 The breathable mesh back, padded seat, and adjustable headrest provide plenty of support. Perfect for a business executive or home office workspace. Free shipping and warranty available on all office furniture. InSync embodies the next evolution of innovative office chair design. The weight activated Body Balance control is a breakthrough. The InSync is simple, intuitive, and easy to use. No tension adjustment and just one lever to adjust the seat height. A durable modern chair at an affordable price. Order today and get free shipping! 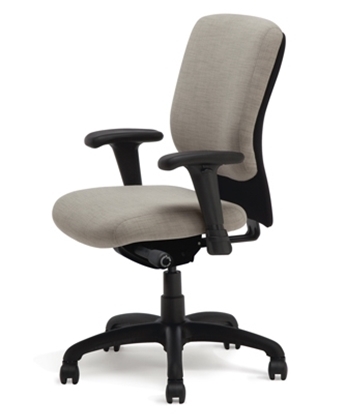 The Highmark InSync embodies the next evolution of modern office chair design. Its weight-activated Body Balance control is simple, intuitive, and easy to use. There is no tension adjustment and just one lever to adjust the seat height.